By Delores Handy -- Pressure from Gov. Deval Patrick and the community has forced the MBTA to reconsider its timing on the expansion of the Green Line beyond Lechmere. Last month the Massachusetts Department of Transportation announced it wouldn’t finish the project until as late as 2020. It was originally supposed to be completed this month. But meetings this week on Beacon Hill have resulted in a more expedited timeline. By Eric Moskowitz -- More than $15 billion in repairs and replacements are needed to keep the state's aging highway, bridge, and transit network in sound condition, an independent advisory committee warned yesterday. 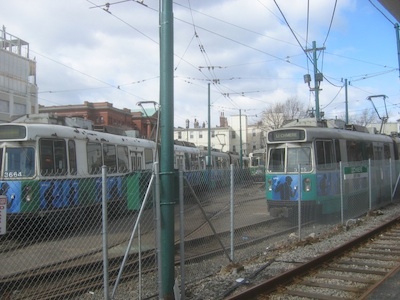 In the Boston area alone, the day-to-day costs of operating the city’s decrepit subway, rail, and bus lines are so overwhelming that riders should expect a substantial fare increase, the first in five years, the top transportation official in Massachusetts said. By Nate Berg -- If you bike to work, you’ve probably got pretty nice thighs. Your lungs, though, may not be in such great shape. New research has found that bicycle commuters may inhale more than twice the amount of black carbon particles as pedestrians making a comparable trip. That healthy bike ride to and from work might be getting you out of a car, but it’s not getting you out of the way of the automobile emissions. By Tanya Snyder -- Buried in the FAA extension passed last week was a line item for air service to connect rural communities to major airports. These are usually tiny flights, leaving from remote airports. All together, they use annual subsidies of over $163 million. The Reason Foundation, the Natural Resources Defense Council, the American Bus Association, and Taxpayers for Common Sense – groups with wildly divergent missions – have come together to figure out if those communities could be connected more sustainably by using buses instead of planes.